Costs – Tree removal and maintenance in Wichita, Kansas become high-priority during drought season. See what residents are paying so you can be prepared should your trees need pruning, cutting or removal unexpectedly. FAQs – With the drought causing the city to cut down almost 20,000 trees in the past, there’s a great need to start replacing those trees. Before you go to the nursery though, here are some facts about which trees are the most drought-resistant, which aren’t, diseases to keep watch for when you plant, and more. Services – Tree service professionals in the Wichita area are always aware of drought conditions and do their best to keep everyone’s trees in the best condition possible to handle it. See which is closest to you from the list below and call with questions today. How Much Do Tree Services Cost in Wichita? Wichita, Kansas trees need regular maintenance and care to handle the harsh conditions they sometimes go through during periods of drought. It’s important that residents in the area have their trees trimmed, pruned and cut regularly to promote growth during the good season so their trees can stand against the harsh weather conditions. Below are the average prices for tree maintenance and removal services in the city. Wichita tree owners will pay on average $669 to have a tree removed from their property. This price can go lower to $531 if removing the tree takes less time and requires less special equipment for the job. On the other hand, the price can rise to $807 or higher if the tree is extremely thick, has a lot of branches, or is close to power lines or the home. The arborist will quote the price based on these factors, along with labor and general project costs. Stump grinding will cost between $75 and $150, depending on the circumference, location and type of wood the stump is made of. Stump removal, on the other hand, will cost more because it involves the complete uprooting and hauling away of the stump. Wichita residents are looking at a price somewhere in the range of $200 to $300. Tree trimming, pruning and cutting of trees in the Wichita area will cost between $100 and $200. Factors will include the number of trees, type, branch patterns, height and labor costs involved in the job when the arborist comes out the first time. The trees might be high maintenance because they have so many branches or are higher up. On the other hand, they could be short trees with fewer branches, requiring less time and visits to stay well-kept. Consult your arborist to determine how much work will go into the maintenance of your trees so you can plan ahead. In 2011, Wichita had to cut down 3,000 trees due to drought. In 2012, the same problem forced the city to cut down 6,000 trees. In 2013, it’s had to cut down 10,000 trees that are dead due to drought conditions. Almost 20,000 trees in three years dying from bad conditions means that residents need to be conscious of conditions and take care to pick surly trees that can endure. Growing fruit trees in Kansas, especially in Wichita, is going to be a long-term commitment. Some species can thrive, but it’s going to take a lot of spraying for pests and watering, especially with the drought conditions. Species that can handle the climate, save for the drought itself, include apples, cherries, apricots, peaches and pears. 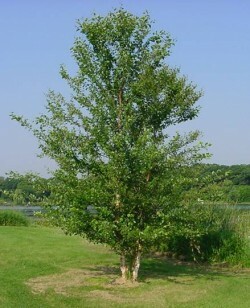 Do not plant Bradford pear trees though, as they cannot handle the climate. While Wichita doesn’t have any tall trees, there’s a privately-owned arboretum about 35 miles west of the city in Waterloo that holds claim to four of the state’s tallest trees. Residents can make an appointment to go out and see them, including a Loblolly pine (Pinus tæda) that stands 110 feet tall inside this enclosed space. The arboretum was started by the grandfather of the man currently running the arboretum and considered an experiment back in the day when it was first created. 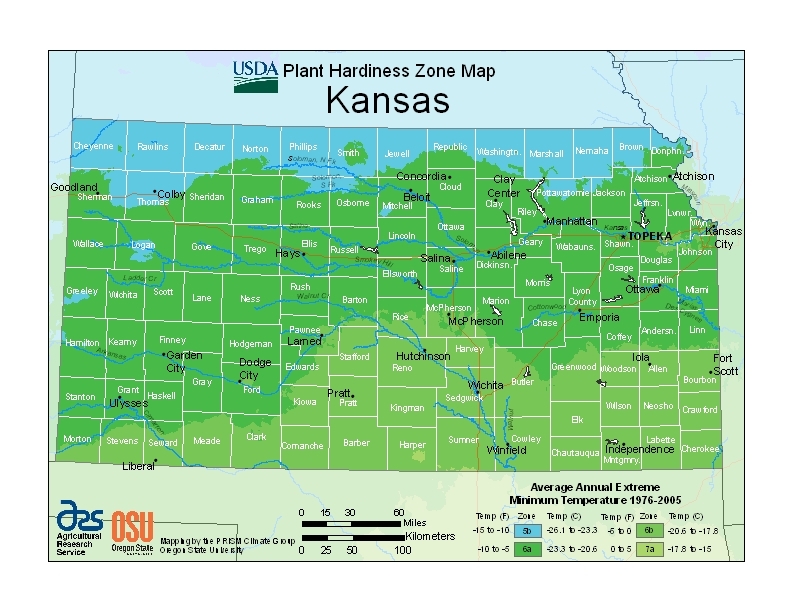 Trees that cannot handle drought conditions or need a lot of frequent watering or rainfall should not be planted in Wichita, at least until regular rainfall starts occurring in the south central area. These types of trees include red maple, river birch, sweetgum, and linden species, as they cannot survive the climate conditions of Wichita and should not be planted. Pine wilt disease can only be stopped by taking down the tree once it’s been infected, so that the disease doesn’t spread to other pine trees. Fire blight is another disease that affects fruit trees and looks like scorch marks, so those parts need to be pruned off as soon as possible to prevent the spread of the disease. 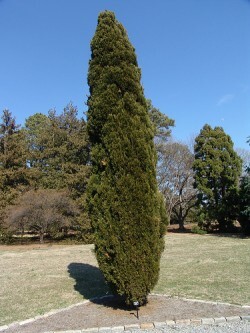 Canker disease and root rot are two diseases you should also watch out for if you own a Wichita blue juniper (Juniperus scopulorum) tree, as it’s very susceptible to these diseases. KCP&L, Kansas’ utility company, recommends that small trees and shrubs are planted at least 20 feet from power lines, medium trees 35 feet away, and large trees 45 feet away. KCP&L also requires that anyone who gets within 10 feet of power lines in the city has a qualified license to work on the power lines, so make sure that your tree service professional is licensed to do so if he’s working on trees near power lines. Residents also have the option to put in a request with the utility company to have vegetation trimmed near the power lines, and the company performs maintenance near the lines regularly.